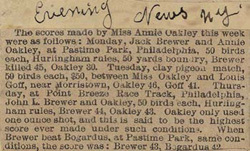 The scores made by Miss Annie Oakley this week were as follows: Monday, Jack Brewer and Annie Oakley, at Pastime Park, Philadelphia, 50 birds each, Hurlingham rules, 50 yards boundry, Brewer killed 45, Oakley 30. Tuesday, clay pigeon match, 50 birds each, $50, between Miss Oakley and Louis Goff, near Morristown, Oakley 46, Goff 41. 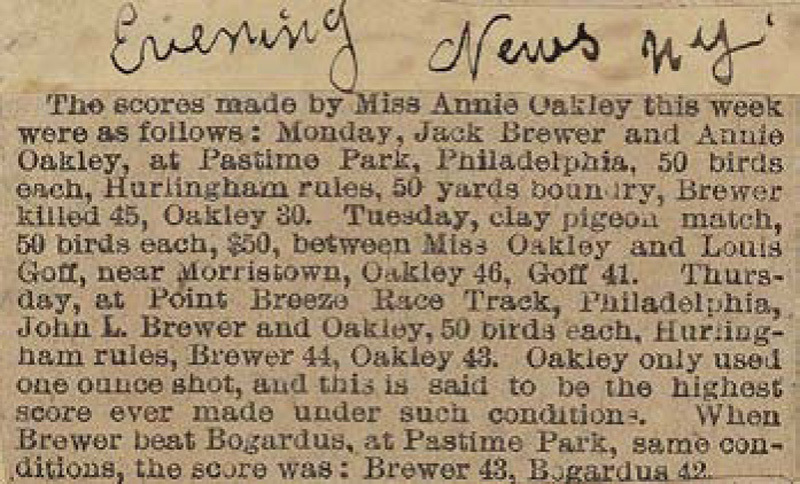 Thursday, at Point Breeze Race Track, Philadelphia, John L. Brewer and Oakley, 50 birds each, Hurlingham rules, Brewer 44, Oakley 43. Oakley only used one ounce shot, and this is said to be the highest score ever made under such conditions. When Brewer beat Bogardus, at Pastime park, same conditions, the score was: Brewer 43, Bogardus 42.